The Dannon Company has agreed to pay $21 million to settle a lawsuit filed by 39 states, challenges health claims in the company's advertising of Dannon's Activia and DanActive products. "With today's settlement we are sending a strong message to food manufacturers who continue to push the limits on health-related marketing claims," said Ohio Attorney General Richard Cordray. "Deceptive advertising is absolutely unacceptable and will not be tolerated." "Dannon made up fancy names for bacteria in its Activia yogurt and dairy drink, marketed them as having unique health benefits, then milked the public's willingness to believe those claims," Washington State Assistant Attorney General Bob Lipson said. The Federal Trade Commissionsimultaneously announced a settlementwith Dannon that addresses the same concerns but does not require a payment. The lawsuit alleges that Dannon made unlawful claims in advertising, marketing, packaging and selling of Activia yogurts and DanActive dairy drinks, including claims that were not substantiated by competent and reliable scientific evidence at the time the claims were made. Dannon represented that Activia helped to regulate the human digestive system based largely on the presence of one ingredient, a bacterial strain with purported probiotic benefits that Dannon trademarked under the name Bifidus Regularis. The attorneys general allege that Dannon represented that Activia improved intestinal transit time when one serving per day was consumed for two weeks. However, a majority of studies demonstrated a benefit only for individuals who consumed three servings per day for two weeks. Dannon also produces and distributes DanActive dairy drinks. Dannon represented that DanActive provided consumers with "immunity" and cold and flu prevention benefits. The lawsuit alleges that those claims are unlawful, and further, that Dannon lacked adequate substantiation to support those claims. As with Activia, Dannon's advertising and marketing emphasized that DanActive contains a probiotic bacterial strain. In DanActive's case, Dannon trademarked the bacterial strain under the fanciful name, L. casei Immunitas. The settlement terms limit the claims that Dannon can make regarding the covered products. Specifically, Dannon may not represent that the covered products can prevent, treat, cure or mitigate disease. Additionally, Dannon must possess competent and reliable scientific evidence to support otherwise permissible claims about the health benefits, performance, efficacy or safety of its probiotic food products. 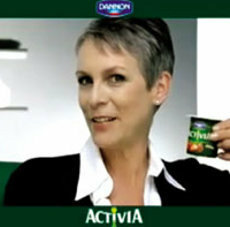 In one TV spot for Activia yogurt, actress Jamie Lee Curtis lounges on a couch holding a newspaper. She tells viewers that many people suffer from irregularity, and that "our busy lives sometimes force us to eat the wrong things at the wrong time." She reassures viewers that Activia can help. The screen then shows a woman's midsection, on which a clump of yellow-green balls is superimposed, representing the transit of food through the digestive system. The balls merge into a downward-facing arrow, which moves off the screen while a man's voice states, "With the natural culture Bifidus Regularis, Activia eaten every day is clinically proven to help regulate your digestive system in two weeks." According to the FTC's complaint, the ads for DanActive conveyed to consumers that drinking the product reduces the likelihood of getting a cold or flu. In one TV commercial, a boy takes an exam at school, plays baseball in the rain, and gets thrown to a mat during a martial arts class. The color drains from his face and body as he arrives home, and his mother hands him a bottle of DanActive. A graphic shows Dannon's probiotic ingredient, L. casei Immunitas, plugging holes in the intestinal wall so that purple balls bounce off the wall rather than entering the holes. As a voiceover assures that DanActive is "clinically proven to help strengthen your body's defenses," color returns to the boy's face and body and he is surrounded by a new, protective, yellow shield as he runs out of the house. Dannon is prohibited from claiming that any yogurt, dairy drink, or probiotic food or drink reduces the likelihood of getting a cold or the flu, unless the claim is approved by Food and Drug Administration (FDA). Although companies usually do not need FDA approval of their health claims to comply with the FTC Act, the FTC determined in this case that requiring FDA approval will give Dannon clearer guidance in the future, and help ensure that it complies with the settlement order. Dannon, which houses its largest manufacturing facility in Minster, Ohio, does not admit any wrongdoing and denies the factual allegations asserted in the states' complaint. States participating in this settlement are Alaska, Arizona, Arkansas, Colorado, Connecticut, Delaware, Florida, Hawaii, Idaho, Illinois, Indiana, Kansas, Kentucky, Louisiana, Maine, Maryland, Massachusetts, Michigan, Missouri, Montana, Nebraska, Nevada, New Hampshire, New Jersey, New Mexico, North Carolina, Ohio, Oklahoma, Oregon, Pennsylvania, Rhode Island, South Carolina, South Dakota, Texas, Tennessee, Vermont, Washington, West Virginia and Wisconsin.